There are countless stories in the media complaining about how the Millennial generation is lazy, demanding, overconfident in their abilities, difficult to manage and more. This negative press might worry some business leaders, as Millennials are expected to make up75 percent of the workforce by 2025, but these stereotypes are often greatly exaggerated. I recently sat down spoke with Araceli Vizcaino, marketing manager atAzazie, to discuss Millennials. Vizcaino feels Millennials possess great leadership qualities that we can all learn from, starting with the ten below. It comes as no surprise that Millennials have expansive knowledge when it comes to technology -- after all, they grew up with it. Tech has become an integral part of Millennial life, with 53 percent of Millennials preferring to lose their sense of smell than their digital devices. This one’s more about being products of their circumstances than anything else -- Millennials have higher rates of student debt, poverty and unemployment than previous generations at this life stage, as well as lower overall levels of wealth and income. Since they’ve come into adulthood in difficult economic times, many Millennials are grateful for the jobs they are able to get and bring a hardworking nature and hunger for success into even the most entry-level positions. This can inject life into your office culture and improve productivity. Vizcaino often recognizes this hunger in Azazie employee candidates, and it’s one of the qualities she looks for during the hiring process. According to Vizcaino, Millennials always have an eye towards the future. “Millennials really seem to understand what the next big thing is going to be. They keep everyone in the company up to date on what’s on the horizon, contributing to a forward-thinking office culture that keeps the business on the forefront of new trends,” she explained. Vizcaino’s company is on a mission to reinvigorate the Bridal industry through a streamlined, tech-driven approach, and the only way to accomplish the company mission is by onboarding innovative individuals. 60 percent of the Millennial generation believe that innovation can be learned and takes discipline, not spontaneous inspiration. They are willing to develop an innovation plan rather than sit back and wait for it to happen. Millennials are also highly adaptable, which prevents an office culture from grinding to a halt if something unexpected occurs. “Millennials have lived in a time of change and evolution, so they’re used to it. They take unexpected circumstances in stride,” said Vizcaino. This means that millennials can come up with new solutions for new issues, creating a culture that doesn’t rely too much on the status quo. A company can really thrive when it’s constantly innovating. For example, whenever a team member sees a new social media channel or devises a new strategy to drive results, the team is open to experimentation. Millennials value being inspired, which means that as leaders, they work to inspire others in the office. They build emotional connections with co-workers and employees to get to their hearts -- a surefire way to keep a team close-knit and highly motivated performance-wise. As a company pioneering technological advancement in the bridal retail industry, Azazie is constantly on the hunt for new inspiration. They understand their best sources of inspiration are the customers themselves, which is why they continue to build a content and community marketing strategy that focuses on the real-life weddings of their brides to inspire creativity and ideas in future customers -- a strategy their team of Millennials is responsible for inspiring. Millennials thrive on building organizations with defined visions on how to impact people’s lives. Azazie’s mission is to reinvent the way women buy formal wear and, more specifically, bridal wear. Azazie believes everyone should have access to high-quality, tailored pieces. Everyone across the organization is made aware of this mission and works together to deliver an incredible customer experience. The Millennial generation is accustomed to taking everyone’s perspective into consideration when making decisions, regardless of rank. Instead of blindly following orders, they question, investigate and consider issues that their higher-ups might not notice when making decisions. You cannot expect to change an industry without first rethinking your own internal operations. Just as Azazie is on a mission to elevate bridal party shopping, they’re also driven to offer their own employees the chance to spearhead initiatives and find better solutions to the status-quo. 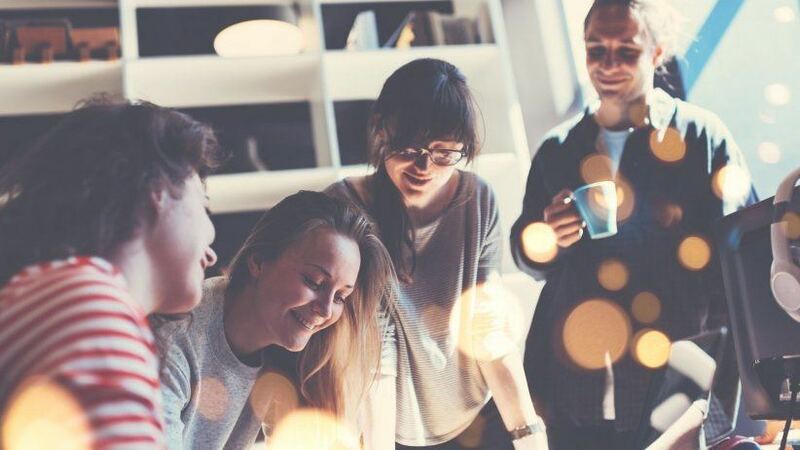 As a result, Millennials contribute to an office culture in which everyone’s on the same level -- allowing for more opencommunication and a more close-knit group. Since Millennials believe in the value of multiple perspectives, they often work well in team environments -- completing tasks and making decisions. A collaborative work environment is quickly becoming a popular structure for improved workflow, as it has been shown to improve office productivity. Millennials in the organization who are already comfortable with this way of working help build a highly team-oriented culture that keeps employees satisfied and productivity high. Vizcaino’s company runs on an open, feedback-driven model. Every team member is encouraged to offer and receive constructive suggestions. Every Azazie employee is held accountable and encouraged to speak up when they have ideas, voicing concerns and listening to the opinions of others. Millennials bring a sense of fun to many workplaces. With less emphasis placed on formality and more placed on bonding with teammates, Millennials can facilitate a more relaxed and fun atmosphere. When employees are happy to be at work, productivity will naturally be through the roof.